Location, great staff, roof deck was awesome. Maybe add a kettle in the room? Beautiful hotel, comfy beds and very clean! Service was great! I will be back for sure! Beautiful hotel. Really enjoyed my stay. Close to the Space Needle and museums and the Monorail to downtown. Location is not close to State convention center as stated. Easy to use Lift/Uber when needed. Very nice hotel with excellent service. It is close to the space needle and attractions. Staff are very friendly and pointed us to good restaurants. Room is spacious but parking is expensive. Great location and wonderful staff. Food was excellent. Really enjoyed our stay! Close to Key Arena, Space Needle, an amazing grocery store called Metropolitan just a few blocks away. The hotel is in close proximity to a several venues (McCaw Hall, Seattle Repertory Theatre, Chihuly Garden, Key Arena, Imax Theatre, Pacific Science Centre to name but a few). 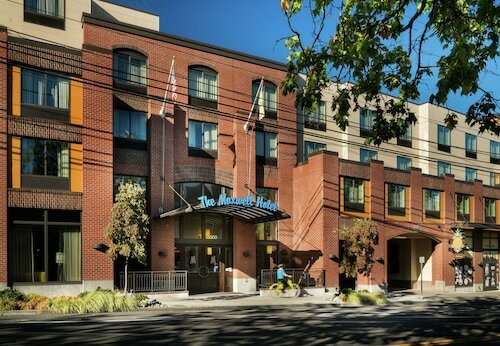 The Marqueen Hotel is in a very good location for those going to events being held at various Seattle Center venues (e.g., Seattle Center Exhibition Hall, McCaw Hall, Key Arena). There is a quality foods across the street and we were able to walk to key arena for the concert. I liked the free use of a bike (although it was too rainy to take advantage of for us. )It's only a 5-10 minute walk (or swim) to Key Arena if you are there for a concert. Key Arena is located in a vibrant area of Seattle known for its popular art scene and major shopping area. The neighborhood is home to 95 hotels and other accommodations, so you can find something that works for your stay. Mediterranean Inn: This 3-star hotel features free WiFi, a 24-hour fitness center, and a rooftop terrace. It's a favorite with Expedia travelers for its family-friendly amenities and breakfast. Staypineapple, The Maxwell Hotel, Seattle Center Seattle: This 3.5-star hotel features a restaurant, an indoor pool, and free WiFi. 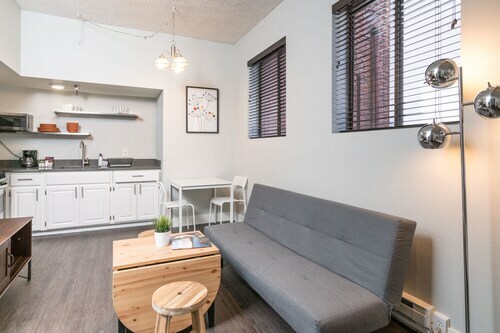 It's a favorite with Expedia travelers for its proximity to public transit and comfortable beds. The Belltown Inn: This 2.5-star hotel features free WiFi, a rooftop terrace, and a 24-hour business center. It's a favorite with Expedia travelers for its central location and helpful staff. Now that you've visited Key Arena, you can discover the sights and attractions within just a few miles of the area. You might want to spend some time browsing the exhibits at Chihuly Garden and Glass, Museum of Pop Culture, or Pacific Science Center. Seattle Center, Seattle Waterfront, and Pike Place Market are some of the local landmarks to explore. You can catch a show at Moore Theater, 5th Avenue Theater, and WaMu Theater. If you want to see more of the surrounding area, you can plan a visit to Space Needle and Seattle Aquarium. You might also stop by Seattle Paramount Theatre, located 1.2 mi (2 km) from Key Arena, or Seattle Great Wheel which is 1.3 mi (2.1 km) away. Head to Seattle Center Monorail Station for metro transit. If you'd like to explore farther outside of the area, you may want to rent a car for your trip.